Current: THIS MADMAN IS A MONSTER! THIS MADMAN IS A MONSTER! Berkeley, CA â€“ 28 November 2011—This is THE BIG ONE! 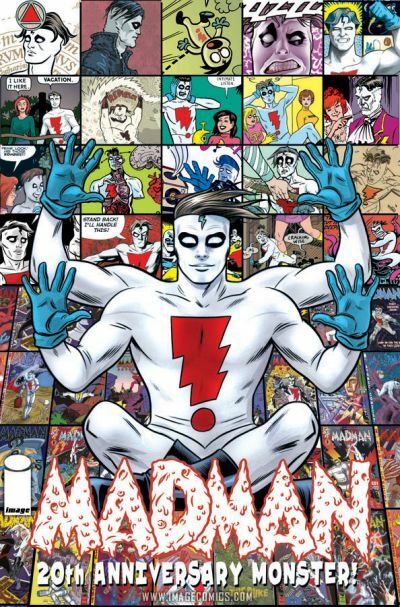 This December, 20 years after Michael Allred’s independent comics icon was introduced to the world, a celebration of all things Madman will take the form of a gigantic 11 x 17 hardcover! The MADMAN 20TH ANNIVERSARY MONSTER HC will include an all-new MADMAN story from Allred, as well as contributions from an impressive list of industry giants such as Darwyn Cooke, Frank Quitely, Jeff Smith, and Erik Larsen. The jam-packed 264 pages of this epic coffee table book will weigh in as the perfect selection for those looking for the most ginchy of gifts this holiday season. The MADMAN 20TH ANNIVERSARY MONSTER HC will appeal to any fan of the heartfelt, retro-pop heroics of MADMAN and Allred’s other critically acclaimed work like X-Statix and iZombie. Nearly every great artist to ever work in comics is in this book! That means more new Madman strips from Peter Bagge, Kyle Baker, Philip Bond & Peter Milligan, Darwyn Cooke, Dave Cooper, Dean Haspiel, Los Bros Hernandez, Erik Larsen, David Mack, Pat McKeown, Bernie Mireault, Michael Avon Oeming, Paul Pope, Eric Powell, Frank Quitely, Steven T. Seagle & Teddy Kristiansen, Jeff Smith, Jay Stephens, Craig Thompson, Matt Wagner, Joe Quinones & Maris Wicks. Plus, almost every Madman illustration collected over the past 20 years from all the greats will be included, including images by the likes of Frank Frazetta, Jack Kirby, Alex Toth, Moebius, Frank Miller, and Dave Stevens. MADMAN 20TH ANNIVERSARY MONSTER HC (OCT110429, ISBN: 978-1-60706-472-5), a 264-page oversized full-color hardcover graphic novel for a hundred bucks, will be on sale in stores on December 21, just in time to make the list of perfect gifts!